Most of us have that “thing” that embarrasses us. We can’t hear, or we stutter, or limp. Personally, I have a lazy eye. It’s embarrassing. Plus I can’t see well, which makes me do more embarrassing things. We despise those things that make us weak–the limitations that keep us from doing more. 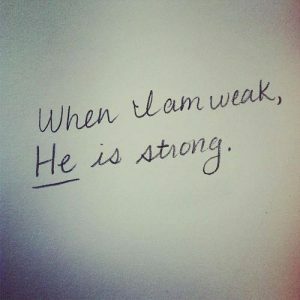 But God views weakness differently. God’s Word repeatedly shows us that God uses the despised, weak, and humble. You have something wrong with you? Great, that means you’re perfect for God to use! One of my favorite examples of this is from 2 Kings 5. There we meet Naaman, a ruler in Syria. Although he’s a mighty and successful man of war, unfortunately, he’s also a leper. The Syrians had recently gotten back from beating up on Israel, one of their favorite pastimes, and a little girl from Israel told Naaman’s wife that there was a man in Israel who could heal leprosy. Well, fantastic! Naaman sent a letter to the King of Israel asking to be healed of leprosy. The King of Israel was shocked and terrified. “Oh great,” he says, “Syria is trying to pick another fight with me.” As a pessimist, I totally identify with this response! Elisha was nearby and heard Naaman’s request. Elisha told the king to send Naaman to him; he would take care of the leprosy. Naaman comes to Elisha for healing. Elisha tells him, “Go and wash in the Jordan seven times, and your flesh shall be restored, and you shall be clean” (2 Kings 5:10). Naaman takes one look at the dirty Jordan River and is repulsed. Dunking himself in the dirty, humble Jordan was not fancy enough. It wasn’t flashy. It didn’t fill him with tingly sensations and awe. Surely there are better rivers and better ways to be healed! He was about to return to Syria unhealed, simply because he didn’t like the humble, dirty method suggested. One of his servants questions him. “Why not just dunk yourself in the river and see what happens?” So, Naaman does, and lo and behold, it works! His leprosy is healed. There are several humble things being used here. 1) A captured and enslaved Jewish girl ventures to help her master. The simple, humble faith of a child. 2) The dirty Jordan River is a method of healing, not some fancy, clean river! 3) Naaman’s servant has the nerve to question his master to get him to take the offer. Through every step of the way, God uses the humble, the dirty, and the servile to get the mighty to see God. If you are broken, hurt, humbled, and beat up, this will never disqualify you from God’s work. In fact, it might qualify you more! The church in many places is persecuted, beaten up, and humbled. Yet God can use the persecuted church to overthrow the powers of darkness. If God only used the mighty, wise, and rich, most of us would be on the sidelines. Not only that, but God wouldn’t get the credit. When mighty, wise, and rich people do things, everyone chalks it up to their might, wisdom, and riches. But God uses the weak and humble so everyone knows that the only explanation as to why this worked is because God did it. The humble church is made up of humble believers obediently following a mighty God. Be humble. Let God do His work. Rejoice in tribulation and weakness, for when we are weak, He is strong. Pray for strength as God’s people come before Him in our times of weakness. Pray that we would walk against the tide of the world and seek to be known as people of humility. Pray for the “weak” church in Middle East and North Africa to experience and see how the Lord is using their weakness.